Made it through the C and D’ transects last night. Started on D this morning when the day shift came on. I’m on the 7am-7pm shift, which is nice. Crew had to re-tap our CTD and then re-spool an entire winch, at sea, yesterday. Unbelievably hard work. Good on ’em. The sea state has stayed mellow, and we’ve got nice sun today. Full moon last night was a sight. So are all the platforms everywhere. 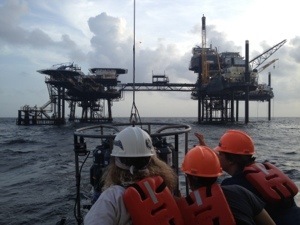 Sampling in the Gulf is a trip because of the ubiquitous oil platforms in our general area. Some of our stations are right next to them. And Nancy’s group even has real-time oxygen sensors mounted on a few at depth. 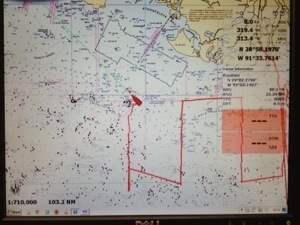 Every one of those little black dots on the bottom half of the screen is an oil platform.